Hi. Hope you are having a good life. An oscilloscope is a fundamental instrument for every electronics engineer or hobbyist to measure or analyze changes in any electrical signal. It displays an electrical signal with respect to time, so you can see every detail of the signal i.e. its shape, frequency, amplitude. 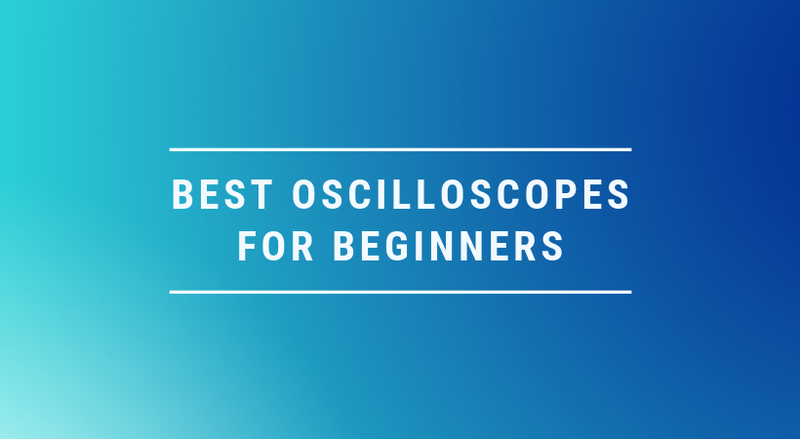 However, getting your own best beginner oscilloscope can be a tricky task. You may have a lot of questions in mind, like what parameters should I look for? What should be the price range for a beginner scope? What are the best oscilloscope making brands out there in the market? And perhaps a lot of more. In this post, I try to help you solve this tricky task and find you the best oscilloscope if you are a beginner or hobbyist. In summary, I will first investigate the popular oscilloscopes brands. Then we will move on to see how oscilloscopes are priced, like what parameters determines the prices for oscilloscopes. Then we will see how to select a scope that would be the best for our requirements. Then I will share some models from the brands we would discuss. And then we will finish our post with detail parameter discussions, like it would for the people excited to know every parameter in deep detail. Of-course everything I share in this post is the best to my knowledge. I am not saying I am an expert. This is just a kind of help. Hopefully, this post will help you. 3 How are the best oscilloscopes priced? 6 Are there other great options available? 8 What is an Oscilloscope? There are lot of manufactures out there making all kind of oscilloscopes i.e. Analog and Digital. Before saying anything about the famous brands, I think, a lot of beginners find it confusing what is analog and digital scope and which one is better. I guess it might be the first question for a lot people reading this. Well, in general I believe it is the time to welcome the new technology i.e. digital. Digital scopes are far more better than analog as they have storing capability and plenty of other options. On the other hand analog scopes have high resolution as they are displaying the signal in real time. Why? Because in digital scope we have ADC (Analog to digital conversion), while in analog there is no ADC process. But clearly we don’t use old analog scopes anymore in general. So, clear your mind from old scope and give your mind a clear answer that we are going to use only digital scope. I am not just saying it in the air. I mean it. They are the best, they are in the industry for quite long time. Everyone who used a scope from these brands are happy with it. They are global brands and have a proven track record. I am sure if you are graduating from engineering university you may have seen a scope from these brands in your labs. Let’s see how are they competing with one another on Google and their overall brand presence. Above trends chart is live. So, there may occur changes in it. The time I am writing this post Tektronix is on the top of the game. It has more brand signals and presence than the rest. So, at this time for me and for you all Tektronix is the best brand among the above listed according to Google. It may change with time. If you are reading this post with trends changed go with brand that is beating the competition. Now, the next question is how to select the oscilloscope that is best for one’s requirements? I think this is the most important thing to pay close attention to. I try to explain everything in a very simple possible language. So, don’t worry. Just grab a piece of paper, pencil and a calculator. Answer all the questions I ask on the paper. By doing so you will have a rough model of your desire best beginner oscilloscope at the end. The selection of oscilloscope depends on lot of things and parameters. Before jumping into parameters explanation and questions, the first step is to answer the following questions. Write all your answers on the paper. For what situation you need a scope i.e. where you are to use it. For example on the bench, at a customer’s site, under the hood of your car. How many signals you want to measure at once? For example, how many measuring channels you will required in your scope. A guess of frequencies you will measure with the scope. According to me you should be very sure of your frequency range to be measured by the scope. This question is very important, please pay very close attention to it. Wrong answer can cause you wastage of money. What are the amplitudes of your signals? In case you don’t know, leave it. Its ok.
Are the signals you are going to measure periodic or non periodic? Coming towards the technical questions. At this point, some of you may get bored. But I am just trying to save you from wasting your money. This is my only intention here. How much bandwidth you will require? The answer is, multiply you highest frequency with 5. For example, if your highest measuring frequency is 10MHz, then the ideal beginner oscilloscope for you is with bandwidth 50MHz. The more bandwidth is not an issue. Like for the said highest frequency you can also use a scope with 100MHz bandwidth, but it is not a good idea. Because it will cost you more money and most importantly if you are not professional you will end in getting high noise floor as well. If you are thinking you are not sure of future. like you want to buy high bandwidth because you are not sure of the signals you will deal in future. Then let me tell you oscilloscopes have bandwidth upgrade options for less cost. You can upgrade the bandwidth in future if need it. For those who want to learn bandwidth in more detail, I explain it at the end of the post. How much sample rate you will need? The answer is The Nyquist criterion which states that the sampling rate must be at least twice the maximum frequency that you want to measure. For example, if your maximum frequency is 10MHz then the ideal scope for you must have sample rate of 20MS/s. Again higher sample rate will end in costing more money. Are you buying a scope to deal with analysis of random signals like to capture the random and infrequent signals or glitches? If yes, then select the one with high waveform capture rate and high memory depth. For those who want to learn memory depth in more detail, I explain it at the end of the post. What resolution and accuracy you need? With a higher resolution oscilloscope, more accurate measurements are possible. Above are the must answer questions. I hope you took them seriously. Now, if you didn’t leave the post and still reading 😀 let’s go further. How are the best oscilloscopes priced? The higher the above parameters, the higher are the prices. That was the reason I was asking you to pay close attention to your highest frequency in your required measurements. Now, I think we have enough information about your beginner scope that we can see at the following models and can decide which is best for us. Well, I just cannot emphasize this how much an oscilloscope is the basic need of every electronics hobbyist or beginner or any person involved in electronics. If you are thinking to learn or go with electronics without an oscilloscope, you are wrong. For me, following are the must in beginner oscilloscopes. Let’s see what I get for you below. This is a great deal, this model got everything. You will simply fall in love with this model. It got a lot of bandwidth ranges. I am sure it will match with your required bandwidth. It got 5-year warranty, which is amazing. Option to select the bandwidth of your choice. For your information, It has 30MHz, 50MHz, 70MHz, 100MHz, 150MHz, and 200MHz. This is crazy and too amazing. Sample rate of 2GS/s, unbelievable. For 30MHz bandwidth, it costs $425. For 200 MHz bandwidth it will cost you $1766. I think this is very decent price range for a beginner. Most importantly it has UL Certified, CE approved, CAT II 300V safety rated. If you don’t know about these terms just keep in mind for short they are safety standards. They are very quiet during operation, as they got no cooling fan which mean greater reliability. In summary, the Tektronix TBS1032B (Amazon link) has got everything a beginner or professional need for his projects. The best alternatives to the above brand are the Rigol, Siglent and Hantek brands. I am sure, you may have heard of these brands in your own research on best oscilloscopes, if this post is not your very first. These brands are popular and trying their best to provide their customers with the best products. Talking about the specific brand, Rigol, is a well-known company, making digital oscilloscopes since 1999. Its products have been used worldwide and people are very much satisfied with its products. I found that they have great customer services, and answer any question you ask them. The model has 4 channels, best for car diagnosis. And if you are dealing with lot of signals at once, this model is for you. 50MHz bandwidth, same as the above model and can be upgraded, so don’t worry. Comes in nice packing and has a beautiful bright screen. In summary, the Rigol DS1054Z (Amazon Link) Digital Oscilloscope is the second choice in selecting the best oscilloscope for beginners. You can use it as a student and can analysis your projects with it. The Siglent Technology is new to oscilloscope industry but its models are too reliable and affordable. I did research on its every model, read people reviews, saw videos, and used my own engineering knowledge to compare it with other brands. At the end, I am very happy and positive about this brand, and decide to list it in my best oscilloscopes list. Like I said, there are a lot of models from this brand. But, in my opinion, this is the best suited for beginners and hobbyists people. I personally like this model too much and it is just beautiful. Sample rate of 500MS/s, this is the real time making the scope so powerful. Lot of math functions including FFT function. This feature is important if you want to analyze signal in frequency domain. Memory depth of 32Kpts, this is a kind of low but it is that too much bad. In summary, the Siglent SD1052DL (Amazon Link) is my best oscilloscope for complete beginners, electronic hobbyists, and electrical engineering students. It will be a tool to measure all your signals, sum them, subtract them, give you the power of each signal, give you the frequency content of it. See the comparison. You see Tektronix is the most expensive but most powerful among them all. 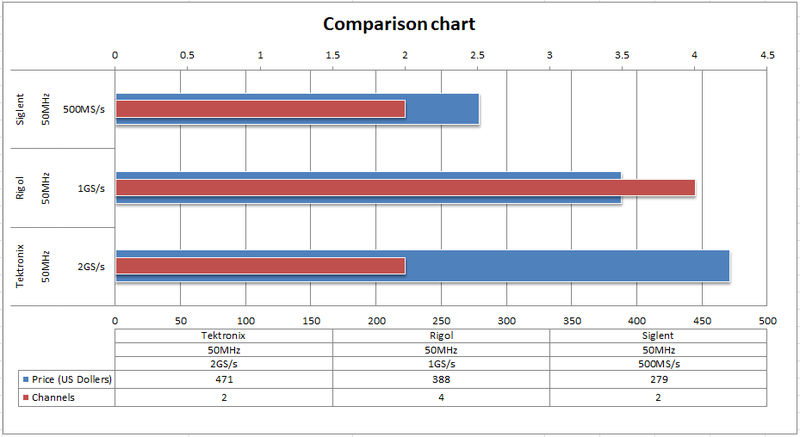 But Rigol beats it in number of channels. Compare you requirement and budget and go for one. They are all the best beginner oscilloscopes. Are there other great options available? Obviously, there are many models you can check online. You will see some USB scopes too, just do not go for them. They are not really good until you buy the high-quality one. I do not think Hantek needs any introduction for the majority of you people. It is well known for providing best quality beginner oscilloscopes. It has all the features as in the above oscilloscopes. I love the model DSO5072P from Hantek for the beginners out there. It is simply amazing. In summary, the Hantek DSO5072P (Amazon Link) can be the best alternatives to above ones if someone is low on budget. It is the most inexpensive scope I listed so far. The only problem with Keysight which made me not to include it in beginner list of oscilloscopes is, it costs you a high amount of money. But you know something, if you can buy this model, the DSOX1102A. It will be your lifetime oscilloscope unless you get more professional in electronics and their happens the demand for larger bandwidth and other stuff. See yourself this model Keysight DSOX1102A on Amazon. I don’t know what you are going to do with these scopes. Good luck for what you gonna do with them. I created the list of applications, which I think can be effectively done by the above listed scopes. In the rest of the post, I give info on what parameter to look for when someone decides to have a beginner oscilloscope in his lab. As I said, an oscilloscope is the most fundamental instrument of every electronics engineer or hobbyist’s lab. Its best use is when it comes to time-varying signals, and a multimeter or all other measuring instrument seems to fail. It gives you a two-dimensional graph of a function (measuring signal) with respect to time, so you can clearly measure the signal frequency, amplitude, shape, rise time, distortion, time intervals, and few other parameters. There exist two main types of oscilloscopes, the digital and analog. There was a time for analog oscilloscopes. I do not know, maybe some people are still using it. My first oscilloscope was analog too, and the first time I introduced to it was during my university first year. But the powerful analog to digital converters has changed everything. Having an oscilloscope is very fundamental, fun and interesting. It gives you the power to see what’s going on with the signals in a circuit. If you are wondering how your sounds waves look like in telephone line, which is a very crazy idea, an oscilloscope is there to make your wish a reality. The journey of an oscilloscope and electronics hobbyist starts at the very beginning. The first simple circuit he can design might be a passive low pass filter. Oscilloscope helps him to see the real-time frequency response of the filter, to analyze and verify the cutoff frequency for the designed filter. Sometimes, a design circuit for some unknown reasons fails. We turn it on, it works fine but a sudden it fails. To analyze this problem, to know what amplitude of impulse signals that are causing the circuit to fail, we need an oscilloscope. Pulse Width Modulated (PWM) signal can only be studied well if you can see it by eye. You can play around with duty cycles and amplitudes in a fun way if you can see it, in my opinion. There are a lot of things to discover about this awesome instrument, the oscilloscope. An electronic instrument is defined as good or bad based on some parameter judgments. A multimeter is good if it has high impedance and it is bad if it has bad safety measures. Same goes for an oscilloscope. Following are the parameter which I think you should understand before you can judge any oscilloscope as good or bad. These parameters are not limited to just beginner oscilloscopes, you can apply it to any of oscilloscope. Bandwidth is the most important parameter of all. It limits the ability of the scope to measure a signal. It shows the frequency range that the oscilloscope can accurately measure. In other words, bandwidth is specified at the frequency at which a sinusoidal input signal is attenuated to 70.7% of the signal’s true amplitude. Oscilloscope is made of complex circuitry. The important part of the circuitry is the front end amplifiers, which work at the certain band of frequencies and define the bandwidth of an oscilloscope. If someone needs a high bandwidth he needs a sophisticated front-end circuitry, which makes the whole oscilloscope very expensive. In summary, the more is the bandwidth, the more powerful the oscilloscope is, and the most expensive as well. But a rule of thumb for selecting a good bandwidth is to have the bandwidth 5 times greater than the fundamental frequency of your measuring signal. A very good point for beginners. If you have high bandwidth and you are playing with a low-frequency signal, you do not get accurate results. You get a lot of noise instead of great results. Sounds crazy! I know. So, basically, I keep all these things in mind and try my knowledge best to make the list of oscilloscopes having bandwidth best for beginners. The sample rate is the ability of an oscilloscope to how fast it can acquire the number of samples per second, or in simple words, it determines the amount of waveform information captured and displayed on the screen. The greater the sample rate, the more resolution it has, and in the result, you have every detail of your signal on display. Above equation is Niquest criteria for sample rate. Oscilloscopes must obey this in order to be called a good or the best beginner oscilloscopes. This is an industrial adopted rule of thumb. But some industry people also recommend a sample rate that is 3 to 5 times the bandwidth. The reason they provide is, you need a high sample rate to see any unexpected glitches or anomalies. In summary, the more samples you have in each period, the more signal detail you’ll capture. Let’s see what Keysight Labs have got for us about the sample rate and bandwidth. A good point for the beginner, without proper bandwidth, you will end in an attenuated or distorted signal. While without enough sample rate you will end in having no information that is very necessary to display the exact frequency, rise and fall times of your signal. You can also miss any glitch or anomaly occurring instantly. One important thing to double check is the sample rate of the oscilloscope when all channels are turned on. Typically, when multiple channels are in use, the sample rate is split up among the channels. If you are using more than one channel, you’ll want to make sure the sampling rate is still sufficient. Memory depth is the measure of oscilloscope’s memory to store signals. The more memory depth means you can capture signal at the highest sample rate. This is a very nice feature and a good oscilloscope must have a good size of depth memory. But it will make it costly. The oscilloscope memory is directly tied to the sample rate. The more memory you have, the higher you can keep the oscilloscope’s sample rate as you capture a longer period of time. The higher the sample rate, the higher the effective bandwidth of the oscilloscope. It is the time oscilloscopes takes to update its screen. It is a very great and important feature to look for. Of course, who cares for an oscilloscope when it takes too much time to update its screen. As in such a situation, there is a good chance you may miss an important signal. Above are the key parameter to look for in a good oscilloscope. Some other following useful aspects can also be taken into consideration. They may not be the important parameters but I feel I should talk about them a little bit. For me, size is not that issue because I love working in the lab. There may be beginners which will use an oscilloscope for car diagnoses. For such people carry oscilloscope where and their, size is of a big problem. The cost is the big issue. But you cannot have a cheap oscilloscope with great features. It just cannot happen. Good bandwidth, sample rates, built in wave generator, FFT, extra channels, good memory depth are the parameters which will cost you money. I keep these problems in mind and try my knowledge best to enlist oscilloscopes you can carry everywhere and are of a reasonable price at a beginner level. An important thing I like to consider for a beginner oscilloscope is the number of channels. I think 2 channels are more than enough. For example, you want to see the communication of Arduino at the same time. Two channels will be enough to see what is coming to your Arduino and what is going away from it or to see the phase difference between 2 pulse trains or any two signals. The best beginner oscilloscope should have some basic math functions i.e. addition, subtraction, multiplication, or FFT. It is very cool and useful to see voltage, current and their product (Power) on the same screen at the same time. This is all that I want to share with you about the best beginner oscilloscope. I shared everything I want myself to be told. Personally, I think, finding the best oscilloscope for beginners or for anyone is the second task. The first task is to find the brand you can trust and has a proven track record. This is my personal approach to buy anything. I used the same strategy here too. In summary, I put myself in the shoes of a person who has just started with electronics or a person who wants to have a basic best oscilloscope. Thank you and have a good life. 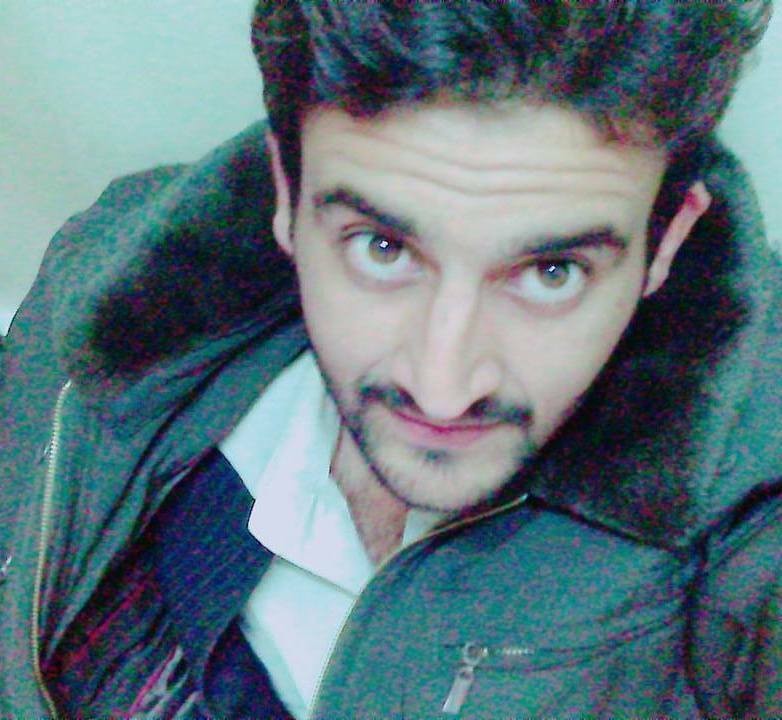 Hi I am Yaman. I am very happy to see you. I love electronics, having fun with it since childhood. Recently earned my degree in Electronics Engineering, and decided to share to the world what I have learned so far. In this blog I share my learning and together we have awesome time. Hopefully, it will be helpful to you and you will enjoy it.